Reflect the heat and keep the soil dark and cool. @sanderson wrote: Reflect the heat and keep the soil dark and cool. So, wouldn't those mylar thingies work better? S, your garden is lookin great. The mylar would work I'm sure. The aluminum seems to work just right, blocking the light but not insulating against the warmth, if that makes sense. 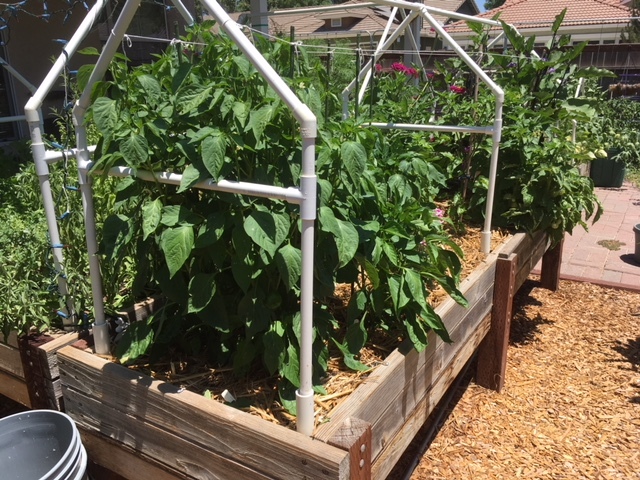 Sanderson, you have a great garden with a variety of setups! Nice work. I just came across your garden paradise.. I love it. to me everything looks neatly placed and nicely constructed.. I could sit there and drink coffee and dream all day...do you do that ? I find dreaming so relaxing..
Jimmy, I actually don't have anywhere to sit down. But I do stroll with my coffee , thinking of things I could do, should do, and wish I could do. @jimmy cee wrote: I just came across your garden paradise.. I love it. to me everything looks neatly placed and nicely constructed..
@sanderson wrote: After receiving 3"of rain recently, the weather has been in the 70s and 80s. 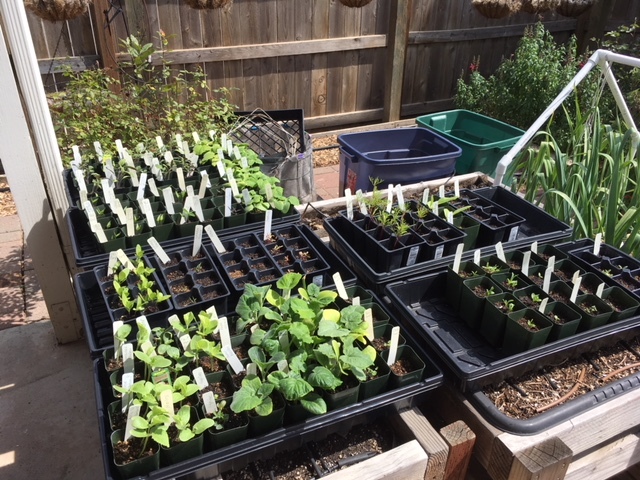 My seedlings are small but they are now outdoors, at least until the rain next weekend. I have had trouble with my iPhone emailing photos to the PC, so I haven't been able to post any photos until today. I'm in the process of amending the beds with homemade compost. First I remove the wood grids or serpentine strings and the driplines. 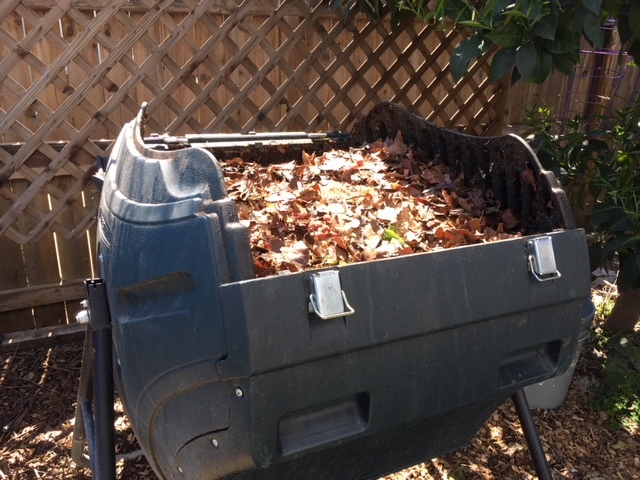 Then dump in buckets of compost and roughly turning it under. Replace the grid work and driplines. The following photos are a 2' x 7' bed being amended and converted for summer. It looked like this during the winter. (Photo is actually a similar 2' x 8' bed.) Yikes! The ground looked so ugly before the wood chips were spread. Here is the 2' x 7' bed being amended and the PVC winter frames being swapped out for the tall overhead summer frames. 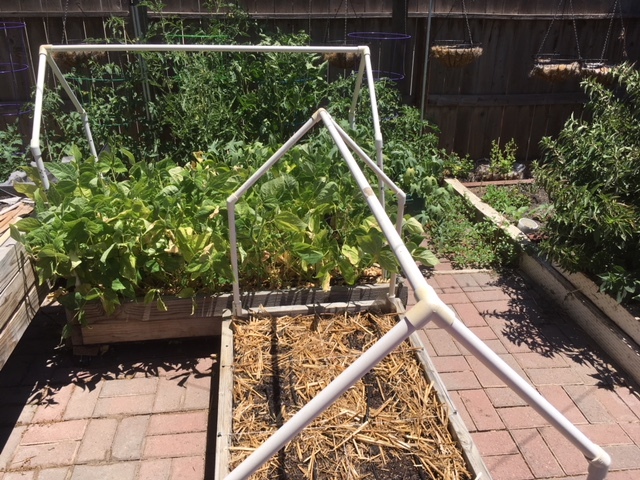 Compost has been added and the serpentine string restrung and the drip lines replaced in the bed. I store sets of frames in heavy plastic sleeves, cut to size. The bottom is sealed using the seal-a-meal. 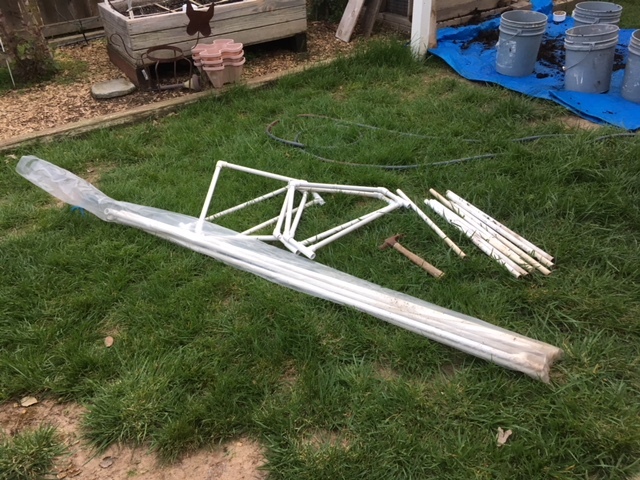 The tall poles are still in the bag in this photo and the winter gable frames will, in turn, be knocked apart and stored in the bag until October. 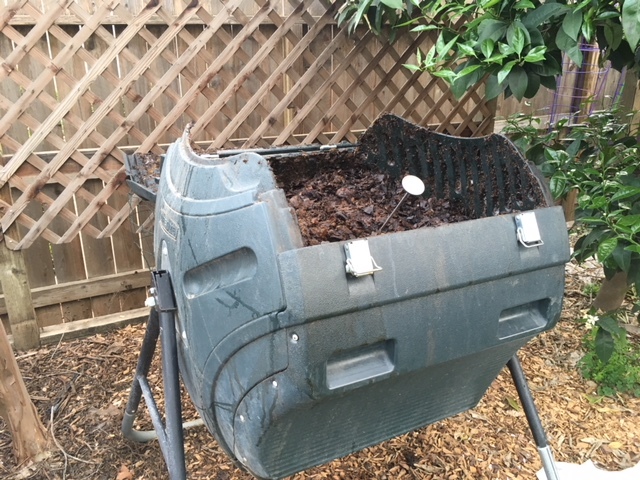 Meanwhile, I started a new batch in the Lifetime Composter on March 26, using leaves, soaked alfalfa pellets, and veggies. It was filled up to the top after this photo was taken. On day 2, March 27, it had shrunk quite a bit so I topped it off with more leaves, soaked alfalfa pellets, and gasp! expired canned food and packages! Tomato sauce and diced tomatoes, oranges, cream of mushroom and celery soup, grains, canned cherries, beef broth, etc.! 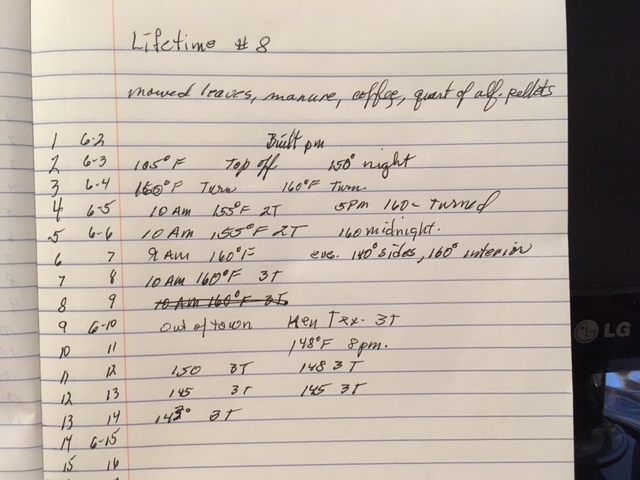 Days 3, 4, 5 and 6 the temps reached 131*F, 148*F, 160*F and 160*F. I have been turning it once a day to provide fresh oxygen and to let off some steam. It was filled to the top ate this photo was taken. Day 6 after another turning and probe thermometer replaced. Last photo, I promise. 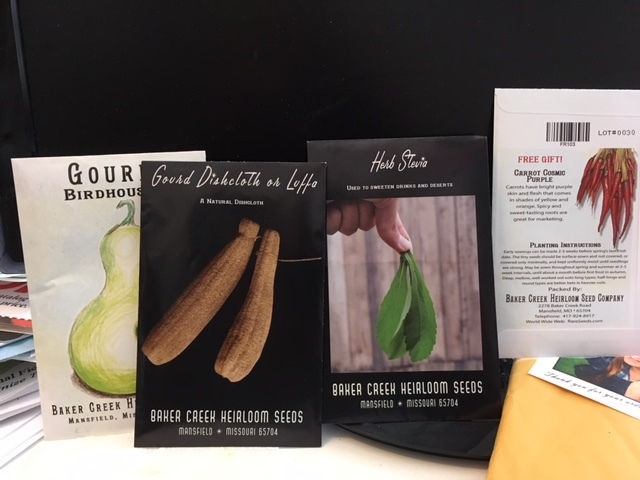 Last order from Baker Creek arrived. Hi Sanderson, I am interested in your lifetime tumbler. quality and sturdyness are my biggest concerns. Can you comment ? Thanks. I just responded in the other thread! I love it for so many reasons. We have hit the summer solstice and the temps have hit the 100*F mark plus a few times. From here on out it will be just plain hot with a few days of relief in the 90s. As the weather changes, so do my plants. Once fresh green, they no longer look like something out of Better Homes and Gardens. You could call this the early summer uglies, which will just get worse over the next 3 months. I'm posting these photos to show newbies that not all gardens look beautiful,. If they give you produce, they are "beautiful". 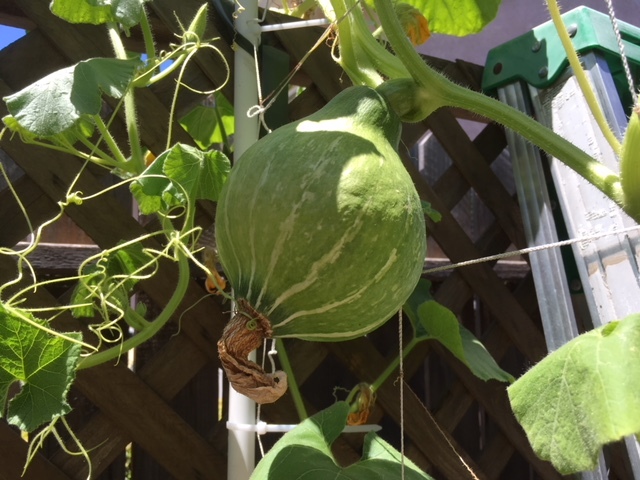 Cantaloupe and sweet melon planted 1/square in a 2'x4' bed with lots of trellising. The lateral vines have escaped their cage! Hales cantaloupe. I have some mesh produce bags that I will slip over the melons in case Rocky, a rat or the 'possum wants a snack. 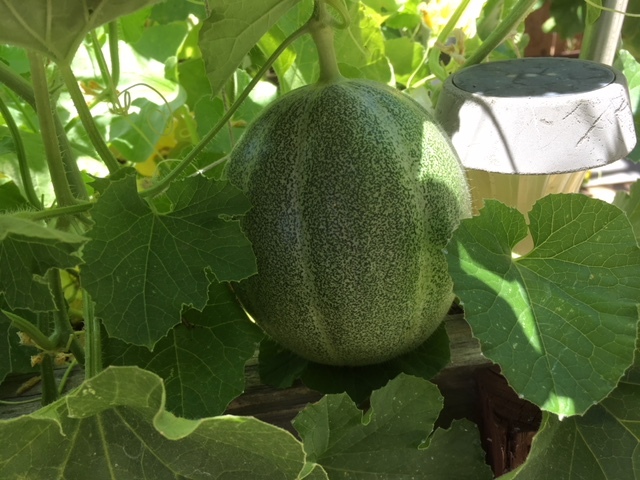 Sweet Melon, new for me. 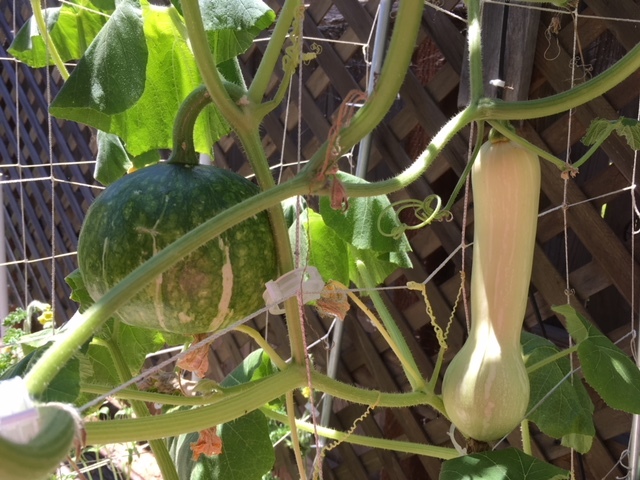 Cantaloupe left bed and Winter squash right bed. 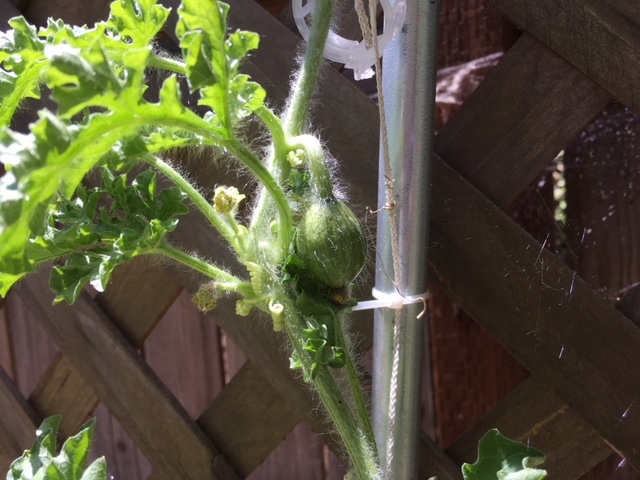 The cutest little watermelon with lots of fuzz in the winter squash bed. It may or may not be pollinated enough. Time will tell. 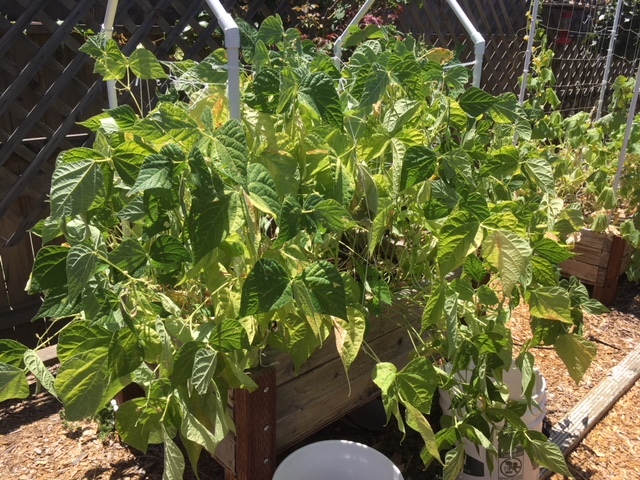 Cucumbers taking a beating in the heat. Still getting good Munchers, enough for one a day. The Blue lake bush beans have been producing well. Leaves are yellowing and falling off and it looks a little wild right now. As long as it produces I'm happy. Pepper box. Not many peppers this year made it from seedling to planting. So I added 2 Snow Fairy compact tomators and 2 Japanese Millionaire eggplants. 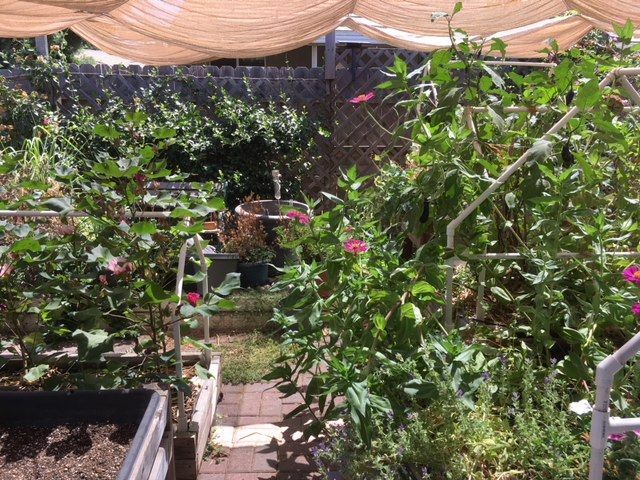 Indeterminate tomatoes and flowers with the wrap of trellis netting. 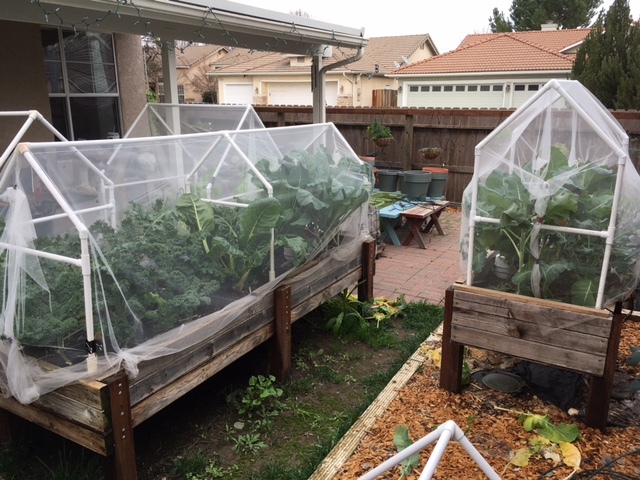 I really like the netting idea as it buys me time to get out and sort through the stems and unwanted suckers. 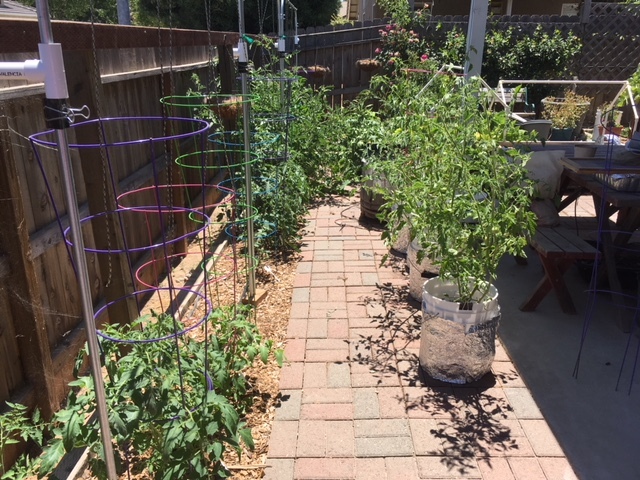 Tomato row in the BTE and 5-gallon buckets. I finally wrapped the buckets with their aluminum foil protection. The corn planting was not a great success. The trellis netting seems to be holding them upright at this stage. I really, really need to have some horizontal "stops" in case there is a big gust of wind. 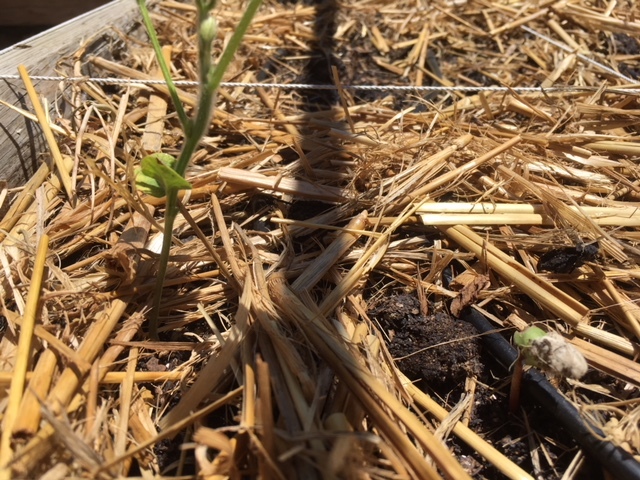 First cotton seedling to sprout, shown next to the only soy bean to sprout out of 72 beans! The cotton bed held the winter garlic. I tried soy beans but they were a bust. So 8 cotton seeds are planted here. The bed immediately behind has the Dragon Tongue beans, which are producing nicely. I put little wire fences around the perimeter but the bean plants have other plans. Camouflaged are the 2 totes with sweet potatoes vines showing. In the background are BTE tomatoes. @sanderson wrote: I'm posting these photos to show newbies that not all gardens look beautiful,. If they give you produce, they are "beautiful". That is the best quote I've seen in a while, and gives me hope. You have a lot of things going on there. Hope you get a good harvest before the heat shuts some things down. 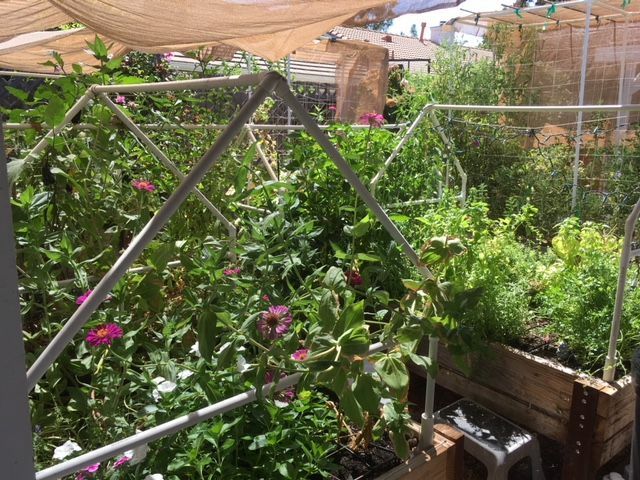 Lots and lots of trellises but they allow a lot of veggies to grow in a small area. Congrats. Thank you. That was the intent. I missed 2 photos. 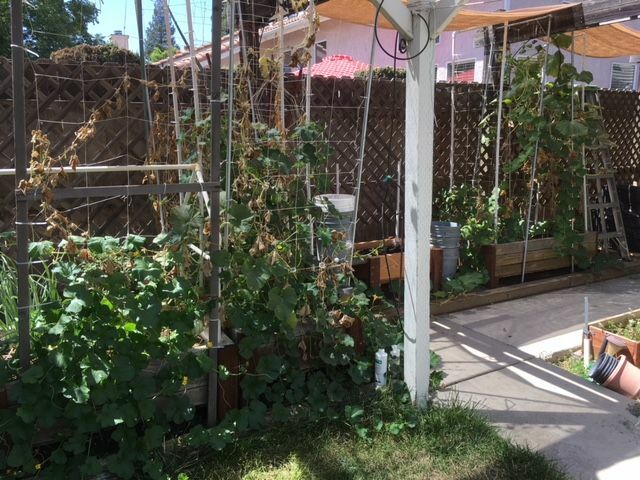 The Blue Lake pole beans on a double trellis and the dedicated flower bed right out the back door. The beans topped the trellis and came back down and back up. @sanderson wrote: I missed 2 photos. 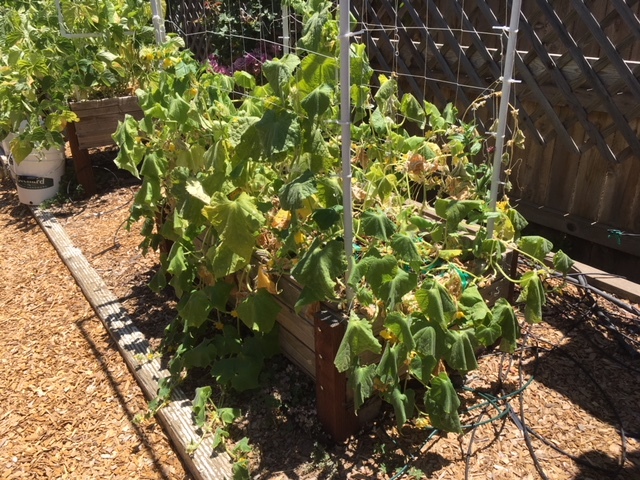 The Blue Lake pole beans on a double trellis and the dedicated flower bed right out the back door. 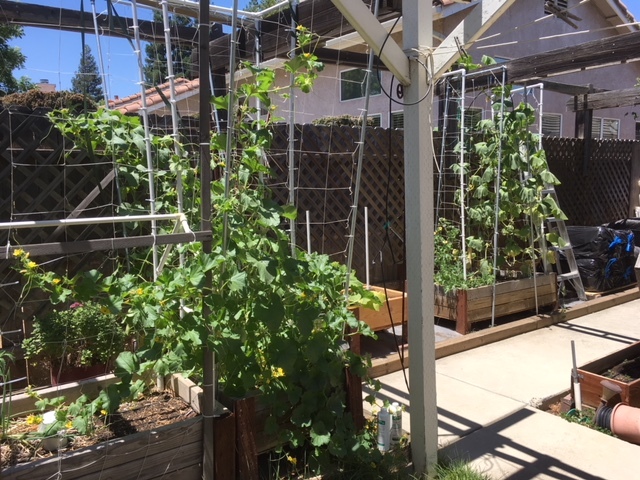 The beans topped the trellis and came back down and back up. Wow Sanderson, your garden looks great. 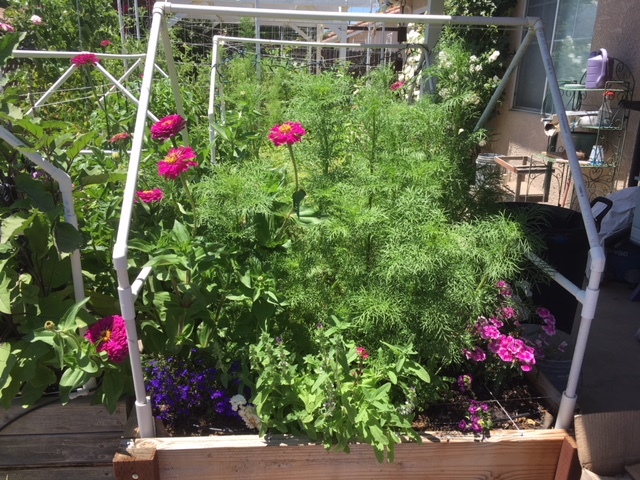 @sanderson wrote: The Blue Lake pole beans on a double trellis and the dedicated flower bed right out the back door. 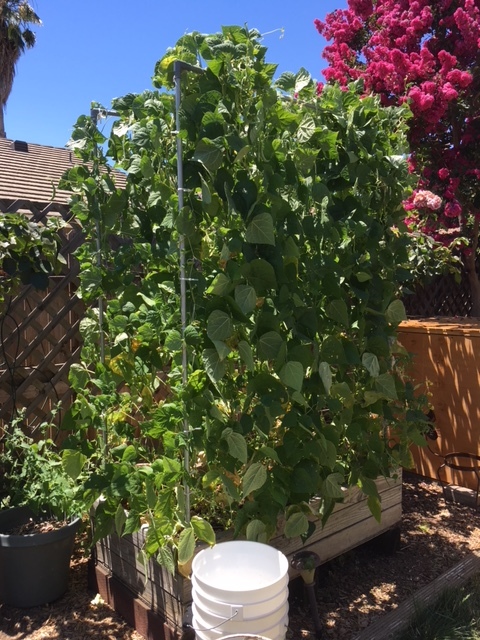 The beans topped the trellis and came back down and back up. WOW, the beans look great! 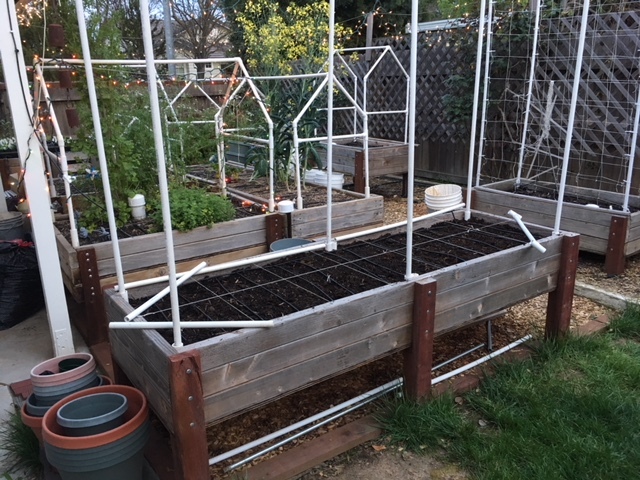 What is the original length of the bean trellis? Are your PVC's shaped like houses for tenting to protect from your 100 F days? Rose, I will measure tomorrow. Probably 6' from the top of the Mel's Mix. The PVC house frames work great for hail or rain storms with 4 mil plastic sheeting. In the winter they are covered with bridal tulle to protect the brassicas and kales, etc. against the white butterfly. If a storm comes up, I have a box of pre-cut and labeled plastic to quickly throw over the frames and tullle. 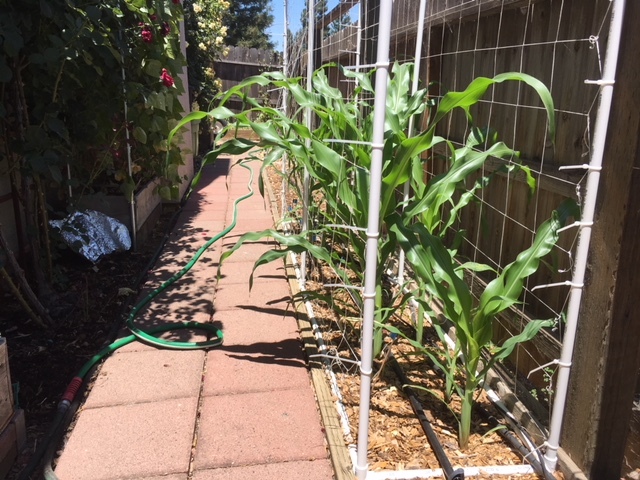 The trellised ones can be covered with sun shade. Sun shade for the house frames is actually suspended over head on paracord runners. Photos maybe tomorrow as we are in the 100s now. 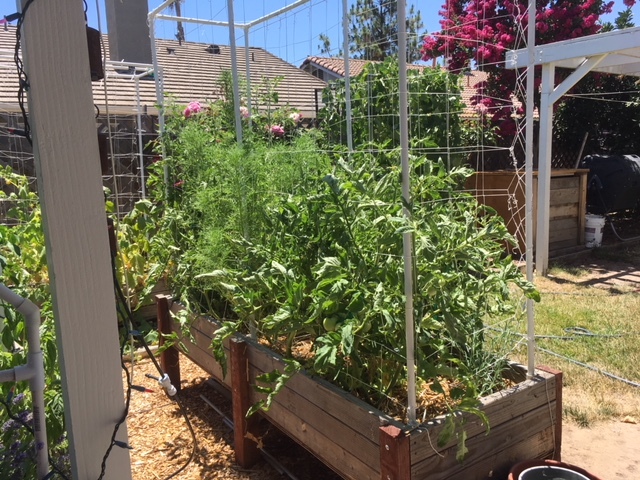 Update on the garden after 1 1/2 months of +100*F degrees. Some of the beds are being cleared, mostly due to spider mites. The lawn is mostly yellow with some new varieties of weeds and grass from the leaves from a neighbor last fall. Ken mowed the leaves last fall on the lawn and oh my goodness, what a collection of unwanted weeds and grasses!! SE corner 8-21-18. Taken before the dying Dragon tongues were pulled in the evening. 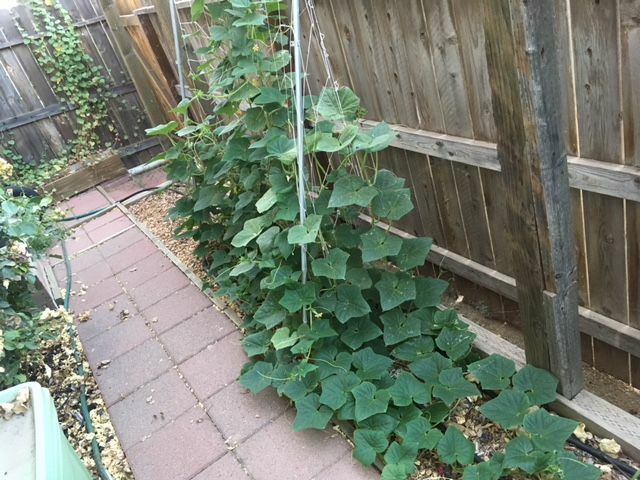 The cotton and sweet potatoes are doing well. The tomatoes are just starting to have a few flowers. Since nothing will grow in the 1' x 4' table top, I'm thinking it may be a good garden tool box with a lid. South 8-21-18. 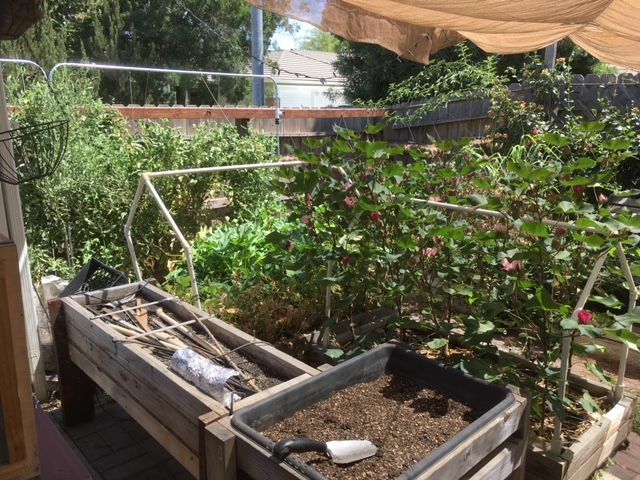 Cotton, flower bed on the right and some trampled purslane. West 8-21-18. Summer and winter squash are gone now. Amended dirt strip. 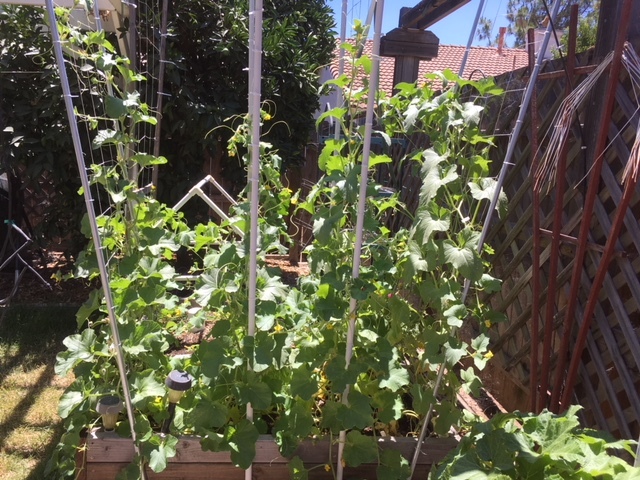 Taken 8-9-18 - 2 extra pickling cucumbers that are doing surprisingly well in the heat. They get shade starting about 1 PM. Everything looks great, even with the horrible temps & drought! August and early September in SoCal aren't my friends for gardening. While our weather isn't as hot typically as Fresno, we have higher overnight humidity. Hence it tends to be PM mania time. I always struggle this time of year with the debate of tearing out plants, trimming plants and hoping they rebound or letting it go. My tomatoes look like they're about done. The leaves are speckled. PM is on the squash like mad. And I can't seem to get green bush beans to germinate. Don't know if its too hot or something eating the shoots off immediately. All the while my garden as a good undergrowth of 'weeds'. Borage. :-), some grass, three or four other california weedy things. Really beautiful work Sanderson. Very refreshing to see. @No_Such_Reality wrote: August and early September in SoCal aren't my friends for gardening. . . I always struggle this time of year with the debate of tearing out plants, trimming plants and hoping they rebound or letting it go. I understand about wanting to rip out the plants at this time of the summer. The pink eye purple hull beans are doing great, but all of the "green" beans are done. Squashes, also. 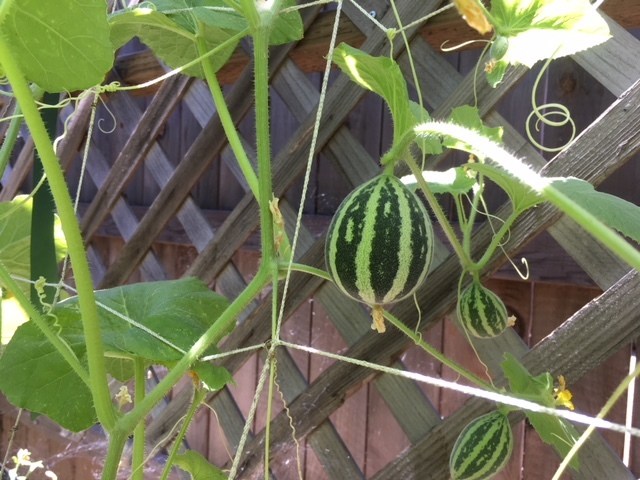 I would have removed the 6 remaining cantaloupe plants if not for the three fruits growing. 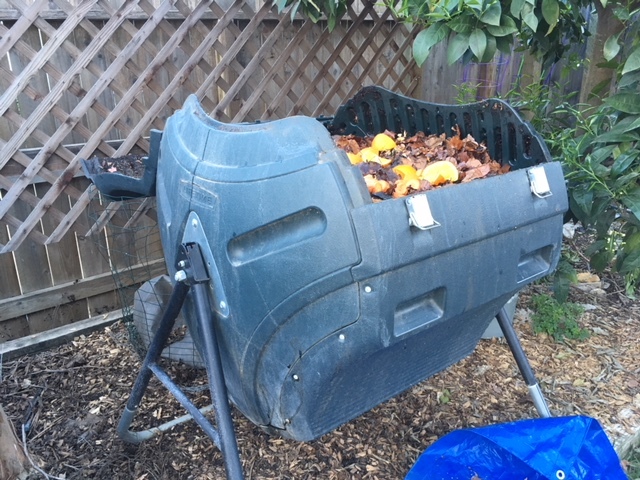 Jimmy, can you look at "Compost Tea Recipe" and give a comment on what I bought? Thanks. @jimmy cee wrote: Really beautiful work Sanderson. Very refreshing to see.